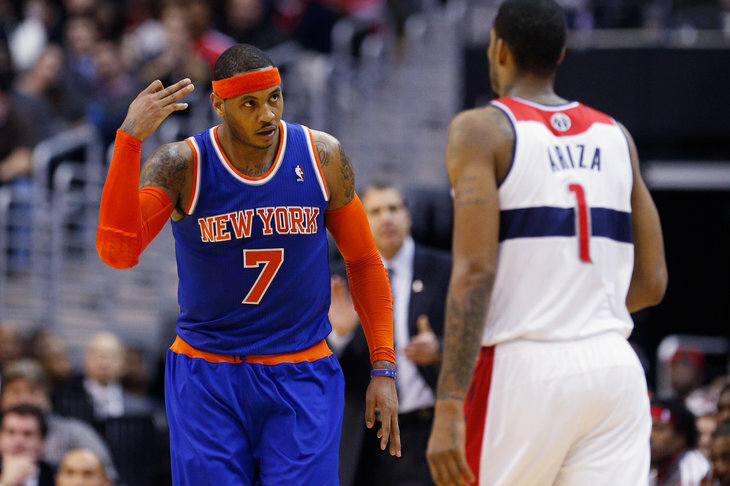 The Knicks (33-43) will host the Wizards (39-36) on Friday night at Madison Square Garden. Gametime is 7:30 PM. The Knicks know this is a huge game for them and must do whatever it takes to get a win. As always, keys to the game include ball movement, knocking down open shots, and effort (especially from Tyson Chandler). The Wizards have the quickest point guard in the league; John Wall is a matchup nightmare for the Knicks. Raymond Felton can’t guard him. So Raymond Felton shouldn’t guard him. It’s up to Mike Woodson to make the obvious and correct decision to have Iman Shumpert— who did a fantastic job on Deron Williams Wednesday night— guarding Wall whenever they are both on the court. It will be Shumpert’s responsibility to avoid committing foolish fouls that keep him off the court. The Knicks were unstoppable on Wednesday when they were moving the ball, but allowed the Nets to make a bit of a run in the 3rd quarter when Carmelo Anthony and his teammates started looking to play 1-on-1 ball. This can’t happen tonight. The Knicks need to be unselfish throughout the game. Chandler did a solid job Wednesday, but his effort level has been inconsistent this year, so it’s anybody’s guess whether he will show up tonight. The Knicks need their starting center to provide energy and leadership tonight. Washington has some pretty good shooters, including Bradley Beal. Beal and Martell Webster torched the Knicks when the Wizards came to the Garden in December, and that can’t happen again tonight. The Knicks enter tonight tied for the final playoff spot in the Eastern Conference. If the two teams finished tied at the end of the season, Atlanta would win the tiebreaker. New York, at 33-43 has 6 games left, while the Hawks, at 32-42, have 8 games remaining. Atlanta plays the Cleveland Cavaliers tonight. If the Knicks can play a good game, they can put a lot of pressure on the Hawks. Let’s see if we can get a win tonight. This entry was posted in Articles and tagged KNICKS, knicks blog, KNICKS MEMES, Knicks news, knicks pregame, knicks pregame report, knicks scouting report, new york knicks, New York Knicks Memes, Tommy Rothman, tommy rothman knicks on April 4, 2014 by Tommy Rothman.